This 7 nights Glacier Express tour package lets you travel through Switzerland by train at a relaxed pace. You will be staying 2 nights each in Lucerne, Interlaken and Zermatt, and 1 night in St. Moritz. You will be traveling on the famous Glacier Express between St. Moritz and Zermatt. You will ascend the Gornergrat by cogwheel train for best views of the Matterhorn. In Interlaken you have the excursion up to Mt. Jungfrau (Top of Europe) included. This Glacier Express tour package includes all rail transportation, overnights in 3 or 4-star hotels with breakfast, seat reservations on Glacier Express and the cogwheel excursions to Mt. Jungfrau and Mt. Gornergrat. Runs all year except for a maintenance break at the beginning of winter. Arrival in Lucerne by train 2nd class from the Swiss border or airport. A stunning setting, world-famous sights, exciting modern architecture, endowed museums and much more make Lucerne a thrilling city to visit. Overnight in Lucerne. Day at leisure. We recommend an excursion to following mountain tops: Mount Pilatus – Golden Round Trip or Mount Rigi – Queen of the mountains or Mount Titlis – Titlis Rotair, Ice Flyer Chairlift, Glacier Park & Cave. Overnight in Lucerne. The Glacier Express tour package continues with a rail journey over the Brünig Pass to Interlaken situated between the lakes of Thun and Brienz. Overnight in Interlaken. Excursion to the Jungfraujoch – Top of Europe. The Jungfrau Railway takes you up to the Jungfraujoch-at 3454 m/ 11'333 ft the highest railway station in Europe. Enjoy breathtaking views of the Aletsch Glacier, the longest glacier in the alps. Overnight in Interlaken. Enjoy Switzerland by train with a rail journey through the wonderful Bernese Oberland to the Valais, either via the Lötschberg base tunnel directly to Visp and further to Zermatt. Or by the RegioExpress Lötschberger – the train with big windows using the traditional scenic Lötschberg line to Brig and continue your journey to Zermatt, the famous resort at the foot of the Matterhorn. Overnight in Zermatt. The popular Gornergrat Bahn, Europe's highest open-air cogwheel railway, takes you up to the Gornergrat. On the Gornergrat viewing platform you are surrounded by 29 peaks rising to above 4000 m. Overnight in Zermatt. 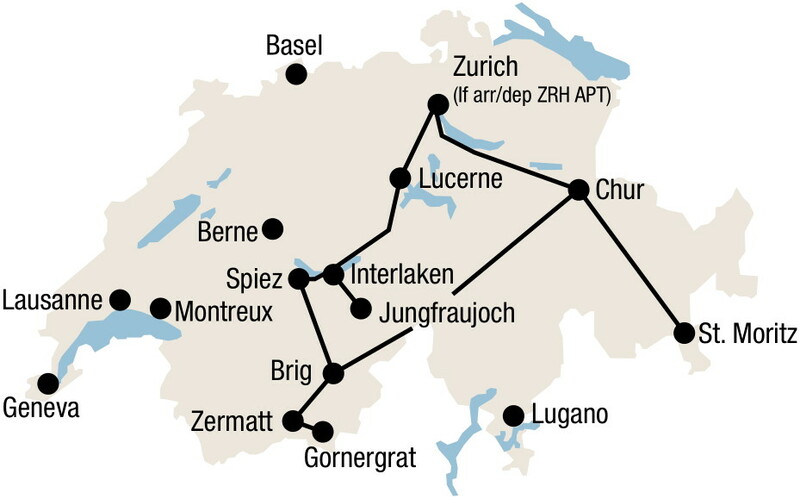 Swiss Transfer Ticket Combi: Swiss Premium Tour (7 transfers) incl. Junfraujoch + Gornergrat in 2nd class from/to Swiss border or airport. 2 nights each in Lucerne, Interlaken, Zermatt, standard room, bath or shower/WC, breakfast. 1 night in St. Moritz, standard room, bath or shower/WC, breakfast.